Most infarctions occur in the left anterior descending coronary artery and cause myocardium damage of the left ventricle. Although current pluripotent stem cells (PSCs) and directed cardiac differentiation techniques are able to generate fetal-like human cardiomyocytes, isolation of pure ventricular cardiomyocytes has been challenging. For repairing ventricular damage, we aimed to establish a highly efficient purification system to obtain homogeneous ventricular cardiomyocytes and prepare engineered human ventricular heart muscles in a dish. 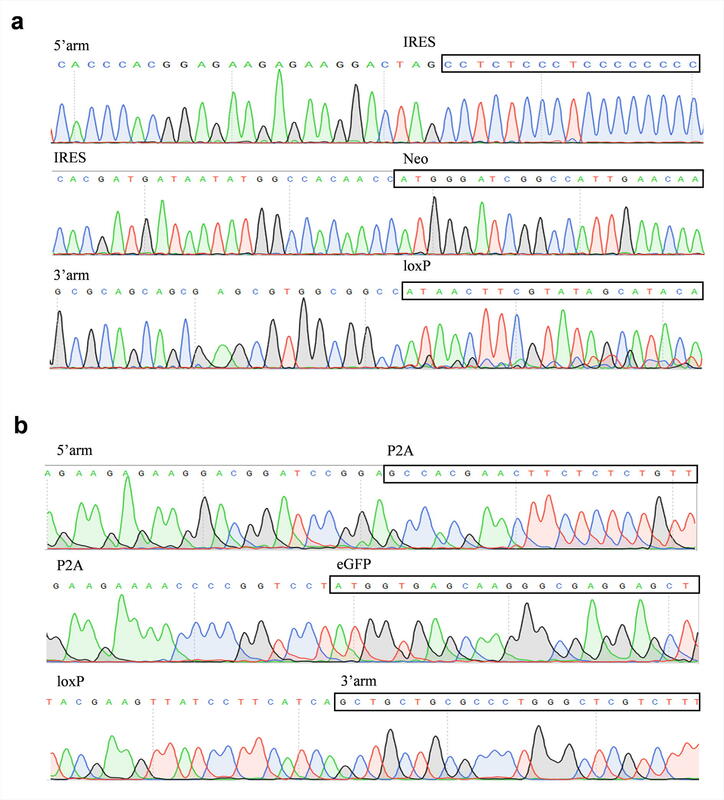 The purification system used TALEN-mediated genomic editing techniques to insert the neomycin or EGFP selection marker directly after the myosin light chain 2 (MYL2) locus in human pluripotent stem cells. Purified early ventricular cardiomyocytes were estimated by immunofluorescence, fluorescence-activated cell sorting, quantitative PCR, microelectrode array, and patch clamp. In subsequent experiments, the mixture of mature MYL2-positive ventricular cardiomyocytes and mesenchymal cells were cocultured with decellularized natural heart matrix. Histological and electrophysiology analyses of the formed tissues were performed 2 weeks later. Human ventricular cardiomyocytes were efficiently isolated based on the purification system using G418 or flow cytometry selection. When combined with the decellularized natural heart matrix as the scaffold, functional human ventricular heart muscles were prepared in a dish. These engineered human ventricular muscles can be great tools for regenerative therapy of human ventricular damage as well as drug screening and ventricular-specific disease modeling in the future. Myocardial infarction (MI) and subsequent cardiac damage and remodeling remains the leading cause of morbidity and mortality in the world. Owing to the anatomic size of human ventricular heart chambers and the hemodynamic features of the coronary arteries after sclerosis, most MI patients present in the clinics exhibit ventricular myocardium ischemia and dysfunction . Therefore, repairing the damaged ventricular cardiac muscles is the central quest for current cardiac regenerative therapies. 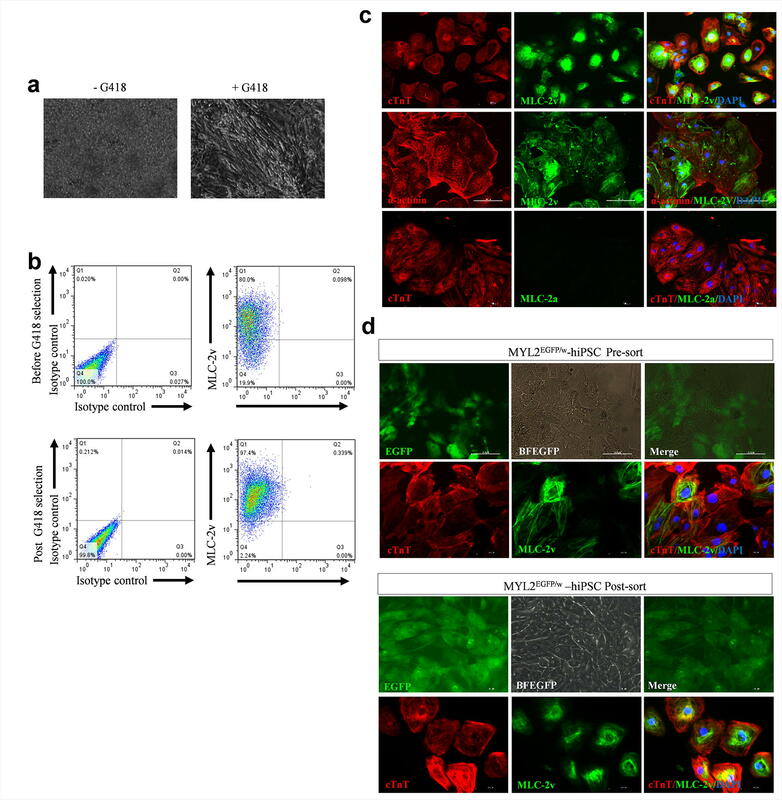 Human pluripotent stem cells (hPSCs), including human embryonic stem cells (hESCs) and human induced pluripotent stem cells (hiPSCs), offered new opportunities for regenerative therapy of human MI [2, 3]. Large-scale production of human cardiomyocytes is now achievable through directed differentiation of hPSCs to the cardiac lineage [4–7], which is able to provide abundant human cardiomyocytes for bioengineering human heart tissues and for cell therapy of myocardial damage. However, cardiac differentiation of hPSCs results in multiple subtypes of cells, including ventricular-like, atrial-like, and sinus nodal-like cardiomyocytes as well as cells of other lineages. 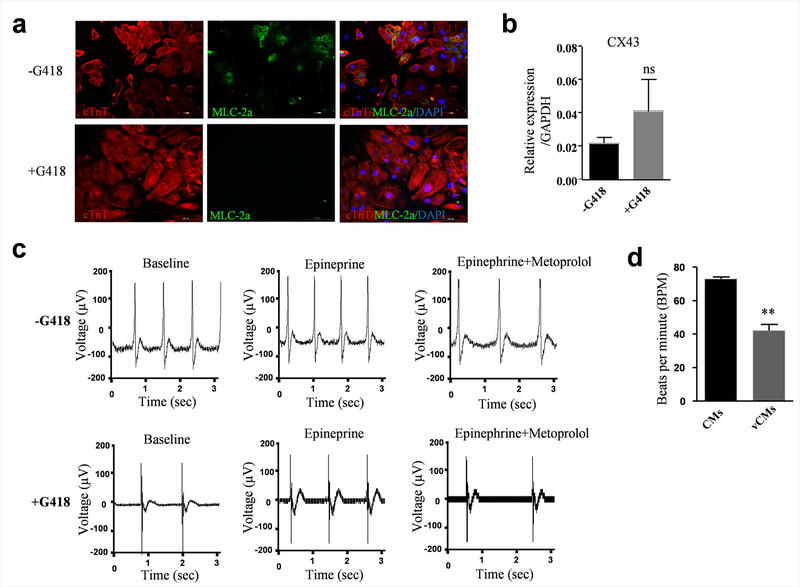 Ventricular, atrial, and sinus nodal cardiomyocytes exhibited different physical and electrophysiological properties [8–10]. A mixture of different subtypes of cardiomyocytes may cause multiple sites of ectopic electroactivities and arrhythmia after transplantation into injured myocardium. Indeed, recent studies on transplantation of suspended hESC-derived or hiPSC-derived cardiomyocytes into the ventricles of nonhuman primates eventually led to a different extent of ventricular arrhythmia [11, 12]. Previous studies have made efforts to isolate working-type cardiomyocytes. One study used a molecular beacon targeting working-type CM-associated markers ; Karakikes et al. attempted to develop a directed ventricular-like cardiomyocyte differentiation system using small molecules and growth factors . For the purpose of human heart tissue engineering or repairing ventricular muscle damage, using a homogeneous population of ventricular-specific myocytes would be more attractive. Since currently there are no specific surface markers for ventricular cardiomyocytes, selection of ventricular myocytes usually relies on endogenous genes expressed specifically in ventricular heart muscles or cardiomyocytes. Myosin light chain-2, the regulatory light chain of myosin, is a critical component of the sarcomere of striated muscles. The cardiac ventricular isoform of myosin light chain-2 (MLC-2v, gene name MYL2) is restrictively expressed in the ventricular segment of the heart tube at E8.0 in mice and remains exclusively expressed in ventricles until adulthood [15, 16]. 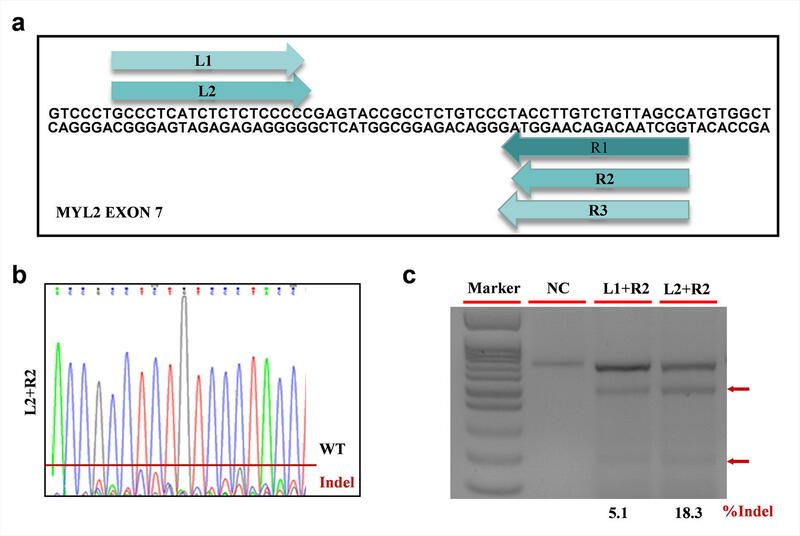 MYL2 is therefore a good genetic locus for driving ventricular-specific gene expression and a specific marker for selection of ventricular cardiomyocytes. Previous studies used either lentivirus-based or adenovirus-based human MYL2 promoter-driving fluorescent protein as a reporter to select hPSC-derived early ventricular cardiomyocytes [9, 17, 18]. They demonstrated that MLC-2v is a robust marker for enriching early ventricular cardiomyocytes after cardiac differentiation of hiPSCs. However, the limitations of a virus-based technique are obvious, which raise safety issues and may not be applicable in future clinical treatment. In this study, we inserted the neomycin or EGFP selection cassette directly after the MYL2 gene locus in hPSCs by TALEN-mediated genomic engineering. Using the internal ribosome entry site (IRES) sequence or P2A peptidase signal in between, both markers were coexpressed with the ventricular-specific MLC-2v when cardiomyocytes were differentiated from hPSCs. Highly pure human early ventricular cardiomyocytes can then be enriched by G418 selection or flow cytometry based on the EGFP reporter, which provides a highly efficient system for the purification of hPSC-derived ventricular cardiomyocytes. Engineered heart tissues (EHTs) represent a promising therapy for myocardium damage in the future. Human ventricular cardiac patches may be more valuable for the treatment of MI since most infractions cause damage in the ventricles. To our knowledge, preparation of human ventricular heart muscles has not been reported to date. With our selected MLC-2v-positive human early ventricular cells, we now are able to generate engineered human ventricular heart muscles in the current study. By combining a fixed ratio of selected hPSC-derived human ventricular cardiomyocytes and mesenchymal cells with pieces of decellularized natural rat heart extracellular matrix (ECM), engineered human ventricular heart muscles of desired shape and size were constructed in a dish. These engineered human ventricular heart muscles have great potential in modeling ventricular heart diseases, in drug screening, as well as for repairing individual-specific ventricular damages in the future. We designed two targeting donor vectors, tagged by the neomycin resistance cassette (donor 1) or EGFP (donor 2), which are connected by IRES and P2A respectively and therefore driven by the endogenous MYL2 promoter. To prevent disruption of target gene expression, the tag was inserted in the adjacent intron downstream of the last exon in the MYL2 gene. We used the internal ribosome entry site (IRES) sequence in between the neomycin coding sequences and the 5' MYL2 homologous arm in the donor construct. We later found that, for the EGFP donor construct with IRES in between the 5' MYL2 homologous arm and the EGFP coding sequences, the expression of EGFP was hard to detect after cardiac differentiation of the engineered hESC lines. We therefore used the P2A peptidase signal in between the MYL2 and EGFP coding sequences. The TAG stop codon of the MYL2 gene was thus removed in the EGFP donor construct. The 5′-homology arm and the 3′-homology arm of the MYL2 targeting donor vector were amplified by PCR, introducing overlapping oligonucleotides to facilitate subcloning into the vector. The 293FT cells were obtained from Shanghai SiDanSai Biotechnology Co. Ltd. Cultured cells were transfected with TALEN plasmids. Genomic DNA was then extracted after 5 days of puromycin selection. The targeted region was amplified for sequencing and T7 Endonuclease I-based Mutation Detection (New England Biolab). Briefly, PCR products were denatured and annealed before T7 Endonuclease I digestion, and finally analyzed by electrophoresis. The human ESC line H7 used in this study was obtained from WiCell Research Institute under a specific Material Transfer Agreement. The human iPSC line was derived previously from human skin fibroblasts in our laboratory  with informed consent approved by the Bioethics Committee of Zhongshan Hospital affiliated to Fudan University. hPSCs cultured on Matrigel (growth factor reduced; BD Biosciences) were disassociated into single cells with Accutase (Invitrogen). Three million cells were electroporated with the TALEN pairs and targeting donor vectors using the Neon Transfection System (Life Technology). Cells were seeded into a Matrigel-coated 10-cm dish containing 8 ml mTeSR1 hPSC Medium (Stem Cell Technology) for recovery at 37 °C with 5% CO2. For the selection of transfected cells, 0.25 μg/ml puromycin was used. Single clones were then picked ∼ 2 weeks later to analyze whether the neomycin resistance (donor 1) or EGFP (donor 2) cassette was successfully inserted via homologous recombination using nested PCR followed by gel electrophoresis and confirmed by DNA sequencing. Correctly targeted clones were picked into six-well plates, expanded, and transfected with plasmids expressing Cre-recombinase to excise the loxP-flanked puromycin resistance cassette. SCID/NOD mice were purchased from Shanghai SLAC Laboratory Animal Co. Ltd. One million undifferentiated hPSCs were suspended in 20 μl Matrigel and injected into the armpit of 8-week-old SCID/NOD mice. All rats were maintained at 24 °C, with free access to food and water. Six weeks after cell delivery, tumors were dissected and fixed with 4% paraformaldehyde in PBS for hematoxylin and eosin (H&E) staining. Cells were fixed in 4% paraformaldehyde and permeabilized with 0.05% Triton-X100 followed by goat serum blocking. H7 and hiPSC colonies were stained with pluripotency marker antibodies OCT3/4 (Santa Cruz), SOX2 (Abcam), Nanog (Santa Cruz), and SSEA-4 (Abcam), whereas hPSC-derived cardiomyocytes were stained with antibodies for cTNT (Abcam), Sarcomeric α-actinin (Abcam), MYL2 (Proteintech), MYL7 (Synaptic system), or EGFP (Proteintech) for 24 h at 4 °C respectively. Cells were then incubated with Alexa Fluor 594 or 488 at 37 °C for 1 h and subsequently counterstained with DAPI. For rat hearts, heart tissues were paraffin-embedded and sectioned, followed by H&E staining. The remaining tissues were embedded with optimal cutting temperature compound (OCT; Sakura Finetek, Japan) and sectioned into sections 8 mm thick. The slides were then labeled with antibodies for Laminin (Thermo Fisher Scientific), fibronectin (Abcam), and collagen III (Abcam). Images were captured with a fluorescence microscope Leica DMi8 (Leica). Both H7 and hiPSCs were differentiated into the cardiomyocyte lineage following modified protocols described by Lian et al. . Seven to 9 days post differentiation, a beating cluster of cells can be observed, while robust spontaneous contraction occurs by day 10. Cultures were maintained in DMEM with 10% FBS under a 37 °C and 5% CO2 air environment. At 22 days post cardiac differentiation, beating cells were digested and seeded into 12-well plates. Then 100 μg/ml G418 (InvivoGen) was used for 7–8 days for the selection of drug-resistant hPSC cardiomyocytes, with medium change every 1–2 days. Total RNA was isolated using the Trizol reagent (Life Technologies) and 3 μg total RNA was used to synthesize cDNA using the ReverTra Ace qPCR RT Kit (FSQ-101; TOYOBO) according to the manufacturer's instructions. Quantitative RT-RCR was performed using the SYBR® Green Realtime PCR master mix (TOYOBO) on a CFX96™ Real-Time System instrument (BIO-RAD). Each reaction was run in triplicate to minimize the variation. Gene expression values were normalized to the mean expression of the housekeeping gene GAPDH. Primer sequences are listed in Additional file 1: Table S1. Dissociated cell suspension was filtered with a 40-μm cell strainer (BD Falcon) to remove cell clumps, and the cells were then fixed and permeabilized using BD Cytofix/Cytoperm™ (BD Biosciences) for 30 min at 4 °C. Next, cells were incubated with the primary antibody, including the mouse anti-human TNNT2 antibody (Thermo Scientific) or the rabbit anti-human MYL2 antibody (Proteintech), followed by appropriate FITC or PE-conjugated secondary antibody. Cells were washed twice in BD perm/wash buffer, centrifuged, and resuspended in 200 μl PBS. To define the threshold for positive fluorescence, the isotype control sample was incubated with secondary antibody only. Data were collected using FACSCalibur (BD Biosciences) and analyzed using FlowJo. A total of 10,000 gated events were counted for each marker in three independent experiments. For the analysis of EGFP+ cardiomyocytes, dissociated and filtered MYL2EGFP/w-hPSC-derived cardiomyocytes were resuspended in PBS, and then acquired with the FACSCalibur system (BD Biosciences). GFP-positive cardiomyocytes were sorted using a BD FACSAria II flow cytometer. After the cell sorting procedure, cells were collected and plated as monolayers (~10,000 cells per coverslip) on Matrigel-coated 12-well plates in DMEM with 10% FBS. Medium was changed routinely every 2 days. Living cells were washed with ice-cold PBS and labeled with Alexa Fluor 647-conjugated Annexin V and PI, and then incubated for 15 min in the dark as recommended. Cells were detected in 1 h using the FACSCalibur system (BD Biosciences). Cardiac action potentials were recorded in current-clamp mode from single beating cardiomyocytes with the whole-cell patch-clamp technique, using an EPC-10 amplifier (HEKA, Lambrecht, Germany). Data were acquired using PatchMaster software (HEKA) and digitized at 1 kHz. Data analysis was performed using Igor Pro (Wavemetrics, Portland, OR, USA) and Prism (Graphpad, La Jolla, CA, USA). V-like, A-like, and N-like cardiomyocytes were identified by action potential (AP) patterns recorded in normal Tyrode’s solution containing 150 mM NaCl, 5.4 mM KCl, 1 mM MgCl2, 15 mM glucose, 1.8 mM CaCl2, 1 mM Na-pyruvate, and 15 mM HEPES (pH 7.4 with NaOH). The pipette solution contained 150 mM KCl, 5 mM NaCl, 2 mM CaCl2, 10 mM HEPES, 5 mM Mg-ATP, and 5 mM EGTA (pH 7.2 with KOH). Neonatal rat ventricular cardiomyocyte (NRVM) cultures were prepared from neonatal 1-day-old Sprague–Dawley rats. The ventricles were finely minced and dissociated with 0.075% collagenase I (Ameresco) and 0.8% Trypsin (Thermo Fisher Scientific) four times, for 10 min each. 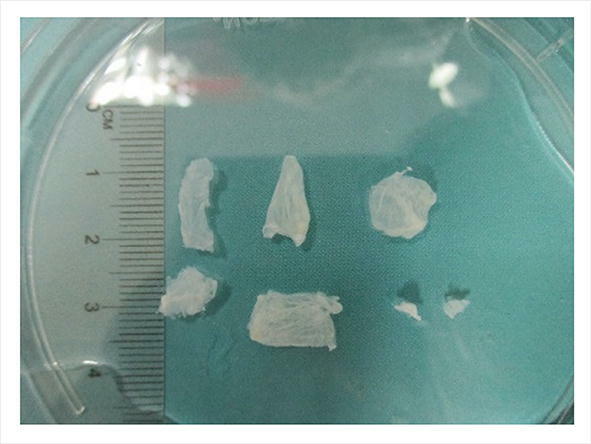 The resulting cell suspensions were passed through a cell strainer (100-μm mesh pore size; BD Biosciences) to obtain a single cell suspension, and were seeded in 12-well cell culture plates (Corning Life Sciences). For establishing cocultures, on the day of NRVM isolation the hPSC-CMs were counted and mixed with the NRVMs in a ratio of 3:1 before plating. At day 1 of culture, cells were incubated with Brdu (10 μg/ml; Sigma-Aldrich) to inhibit nonmyocyte proliferation. Dissociated hPSC-derived cardiomyocytes at 20–21 days post differentiation were plated onto Matrigel-coated six-well plates in mature medium, which consists of RPMI 1640 without glucose (Gibco), 500 μg/ml bovine serum albumin (Yeasen), 213 μg/ml l-ascorbic acid 2-phosphate (Sigma-Aldrich) supplemented with 10 mM d-galactose (Sigma-Aldrich), 4 mM l-lactic acid (Sigma-Aldrich), 1 mM sodium pyruvate (Sigma-Aldrich), 20 μg/ml insulin (Sigma-Aldrich), 1× chemically defined lipid concentrate (Sigma-Aldrich), and 200 ng/ml triiodo-l-thyronine (Sigma-Aldrich). At day 2, the medium was supplemented with 100 ng/ml G418 for another 7 days. From day 9, cells were cultured in mature medium with a medium change every other day. Hearts were obtained from 200–250 g adult rats and cannulated into the ascending aorta with a blunt 20-gauge needle to perform retrograde coronary perfusion. First, sterile deionized water was perfused for 30 min at 2.0 ml/min, followed by perfusion with 1% sodium dodecyl sulfate (SDS) for 3 h, and 1% triton X-100 with 0.5% EDTA (PH 8.0) for another 30 min. The hearts were then washed with deionized water and phosphate buffered saline (PBS) containing 100 U/ml penicillin (Life Technologies, USA), 100 μg/ml streptomycin (Life Technologies), and 1.25 μg/ml amphotericin B (Sigma-Aldrich) for another 2 h.
The decellularized heart ECM was cut into pieces under sterile conditions. The ECM pieces were then put in wells of 48-well plates as a sheet. The mixture of ventricular cardiomyocytes was then seeded onto the sheet at 104 cells/mm2. The ventricular heart muscles were cultured in the mature medium and changed every day. Beating ventricular heart muscles were plated on a 0.1% gelatin-coated microelectrode array (MEA) probe for 2 days with mature medium and then examined by the MEA data acquisition system MEA-2100 (Multi-channel Systems). A 60-channel voltage amplifier system was used for recording ventricular heart muscles. Data analysis was performed with SPIKE2 software (CED.UK). Data were presented as the SEM of three independent experiments. Student’s t test was used to compare two normally distributed data sets. To compare the statistical differences of multiple groups, one-way analysis of variance (ANOVA) was used. P < 0.05 was considered statistically significant. To insert the neomycin/EGFP selection marker under the C-terminus of the MYL2 gene located on chromosome 12, we used TALEN-mediated genomic editing techniques in this study. The overall schema of the donor constructs containing the neomycin or EGFP cassette, the specific TALEN cutting sites on the adjacent intron downstream of MYL2 exon 7, and the homologous recombination events are illustrated in Fig. 1a. The design of the two donor constructs was to allow the neomycin or EGFP to be expressed along with, but separately from, MLC-2v expression after insertion into the 3' terminal of the MYL2 gene. The purpose of this design was to avoid formation of fusion proteins which may severely affect the normal function of MLC-2v, the myofilaments, and the cardiomyocytes. We designed and engineered six TALEN pairs (three left (L) TALENs × two right (R) TALENs) targeting downstream of the TAG stop codon on exon 7 of the MYL2 gene. The L2 + R2 TALEN pair showed a ~20% cutting efficiency by T7EI assays and was confirmed by DNA sequencing (Additional file 2: Figure S1), and thus was used in the subsequent experiments. We next transfected H7 hESCs with the TALEN pair (L2 + R2) and the respective donor construct by electroporation. Positive single clones with successful homologous recombination were then selected with puromycin. Nested PCR using primers flanking the genomic sequence (5' primer) and the donor sequence (3' primer) showed that, in both the neomycin and EGFP groups, 10 out of 14 picked single clones exhibited successful homologous recombination (Fig. 1b). We next transfected these positive clones with Cre recombinase and removed the PGK-puromycin selection cassette. Final DNA sequencing of the genomic sequence of the MYL2 allele confirmed the correct insertion of the neomycin or EGFP cassette (Additional file 3: Figure S2). To see whether our L2 + R2 TALEN pair caused off-target editing that may cause unwanted mutations at another locus in the genome of these positive clones, we amplified the top 10 potential off-target sites (obtained by TALENoffer software ) by genomic PCR and performed DNA sequencing. No off-target editing events were found (Additional file 4: Table S2). We termed these heterozygous hESCs with correct neomycin or EGFP insertion after the MYL2 gene locus as MYL2Neo/w or MYL2EGFP/w hESCs respectively. Under normal culture conditions, MYL2Neo/w and MYL2EGFP/w hESCs maintained typical clonal morphologies and expressed strong alkaline phosphatase activities as normal hESCs did. Immunofluorescence staining showed that these cells expressed pluripotency markers OCT4, SOX2, Nanog, and SSEA-4 (Fig. 2a). Quantitative PCR also showed that the expression level of the pluripotency genes OCT4, SOX2, Klf4, and c-MYC in MYL2Neo/w and MYL2EGFP/w hESCs were similar to those in the wildtype hESCs (H7) (Fig. 2b). Upon injection into immunodeficient mice, MYL2Neo/w and MYL2EGFP/w hESCs formed teratomas containing the three embryonic germ layers (Fig. 2c). These results indicated that insertion of the neomycin or EGFP cassette after the MYL2 locus in hESCs did not affect their pluripotent potential. We next differentiated MYL2Neo/w and MYL2EGFP/w hESCs into the cardiac lineage using a modified 2D directed cardiac differentiation protocol . The differentiated cells usually started to beat spontaneously on day 8 or 9 after differentiation (Additional file 5: Video S1). We consistently obtained greater than 90% of the differentiated cells being cTnT-positive cardiomyocytes by fluorescence-activated cell sorting (FACS) analysis in our routine differentiation protocol (Fig. 2d). Further, MLC-2v expression markedly increased along directed cardiac differentiation and become stable after day 25 post differentiation. In addition, neomycin phosphotransferase II and GFP proteins were simultaneously expressed (Additional file 6: Figure S3), indicating again the correct insertion and expression of the selection system. Immunofluorescence staining of the differentiated beating cells showed that they expressed cardiomyocyte-specific markers cTnT, sarcomeric α-actinin, MLC-2v, and MLC-2a (Fig. 2e). These results indicated a successful cardiac differentiation and the correct selection system for the MYL2Neo/w and MYL2EGFP/w hESCs. Compared to cells differentiated from wildtype hESCs (H7) that all died after G418 selection, cardiomyocytes differentiated from MYL2Neo/w hESCs survived and maintained normal cellular growth as well as beating activities under the stress of G418 selection (Fig. 3a and Additional file 7: Video S2). FACS analysis of the differentiated MYL2Neo/w hESCs based on anti-human MLC-2v antibodies indicated that the percentage of MLC-2v-positive cardiomyocytes increased from ~ 80% before G418 selection to > 98% after G418 selection (Fig. 3b). Immunofluorescence staining indicated the percentage of MLC-2v-positive cells over cTnT-positive cardiomyocytes. G418 selection significantly enriched MLC-2v/cTnT double-positive cardiomyocytes derived from MYL2Neo/w hESCs from ~ 78% to ~ 98% (Fig. 3c, d). Quantitative PCR showed ventricular markers MYL2 and HAND1 were significantly upregulated (Fig. 3e), while atrial markers GJA5, TBX5, and MYH6 (Fig. 3f) and sinus nodal markers SHOX2, TBX3, and TBX18 (Fig. 3g) were significantly reduced after G418 selection. Of note, expression of CX43, which encodes the predominant cardiac gap-junction protein, was not significantly different with the control (Additional file 8: Figure S4b), indicating that G418 selection did not affect expression of normal junctional proteins of these cardiomyocytes. Multielectrode array analysis showed that G418-selected MLC-2v/cTnT double-positive cardiomyocytes exhibited normal electrophysiology, longer field potential duration, and lower beating rate, suggesting they were closer to the ventricular form of cardiomyocytes (Fig. 3 h and Additional file 8: Figure S4c, d). We next examined the electrophysiological properties of these MLC-2v-positive cardiomyocytes by whole cell patch clamping. Compared to nonselected MYL2Neo/w hESC-derived cardiomyocytes that contained ~ 55% cells exhibiting ventricular-like action potentials, G418 selection markedly increased the percentage of cells with ventricular-like action potentials and reduced the percentage of cells with atrial-like and nodal-like action potentials (Fig. 3i and Additional file 9: Table S3). Overall, these results indicated that the neomycin selection cassette inserted following the MYL2 gene is effective in enrichment of MLC-2v-positive early ventricular cardiomyocytes. We next tested whether genomic EGFP insertion after the MYL2 gene can be used to enrich MLC-2v-positive early ventricular cardiomyocytes by flow cytometry. FACS showed that there were ~ 10.4% EGFP-positive cells at day 25 post cardiac differentiation of the MYL2EGFP/w hESCs (Fig. 4a). We then sorted out these EGFP-positive cells and maintained them in culture. These cells exhibited relative weak EGFP expressions possibly because of the low copy number due to only one allele insertion of the EGFP cassette in the genome (Fig. 4b). The EGFP-positive cells all showed strong MLC-2v and cTnT expression but very dim MLC-2a expression at the same time (Fig. 4c, d). After FACS selection, MYL2EGFP/w-CMs survived well and maintained spontaneous contraction (Additional file 10: Video S3). Assessment of viability showed ~ 83.8% of these cells remained active (Fig. 4e). Whole cell patch clamping showed that almost all of the EGFP-positive cells (~91.3%) exhibited ventricular-like action potentials (Fig. 4f and Additional file 11: Table S4). These results showed that, although the expression is weak, EGFP inserted after the MYL2 locus is effective to enrich MLC-2v-positive early ventricular cardiomyocytes from cardiac differentiation of hESCs. In the future, hiPSCs could be a powerful tool and widely used for personalized regenerative medicine. To see whether our MYL2Neo/w and MYL2EGFP/w systems also work in hiPSCs as in hESCs, we next transfected hiPSCs generated in our laboratory  using the TALEN pair L2/R2 and the respective donor construct by electroporation to insert the neomycin/EGFP selection marker under the C-terminus of the MYL2 gene. These heterozygous hiPSCs with neomycin or EGFP insertion after the endogenous MYL2 gene locus were termed MYL2Neo/w-hiPSCs and MYL2EGFP/w-hiPSCs respectively. As shown in Additional file 12: Figure S5 and Additional file 13: Figure S6, our MYL2Neo/w and MYL2EGFP/w systems also work in hiPSCs. To investigate the regenerative therapy potential of these hPSC-derived ventricular cardiomyocytes, we cocultured neonatal rat ventricular myocytes (NRVMs) with the selected MYL2Neo/w-CMs (NN-co-cultures) or MYL2EGFP/w-CMs (NE-co-cultures) in a ratio of 3:1 (Additional file 14: Video S4 and Additional file 15: Video S5). Bright field micrograph showed that NRVMs, as well as NN-co-cultures, formed confluent monolayers. Immunofluorescence staining analyses confirmed a mixture of NRVMs (DAPI+ cells) and G418 selected MYL2Neo/w-CMs (HNA+/DAPI+ cells) in NN-co-cultures (Fig. 5a). Importantly, the same as NRVMs, these NN-co-cultures expressed CX43 (Fig. 5a), which play an important role in the formation of gap junctions between ventricular cardiomyocytes, indicating that the cocultures formed cardiac junctions. Next, we performed multielectrode arrays (MEAs) to investigate the synchronous activities of the NN-co-cultures and NE-co-cultures. Both showed regular and synchronous electrical activities similar to NRVM electrophysiological characteristics (Fig. 5b and 5c), Addition of hPSC-derived ventricular cardiomyocytes to NRVMs did not increase their arrhythmogenicity (Fig. 5d), suggesting a well-coupled syncytium of the hPSC-derived ventricular cardiomyocytes and animal heart cells. For future regenerative therapy of adult human heart damage such as MI, maturation of the hPSC-derived cardiac cells is a necessary step. In addition, the human ventricular cardiomyocytes selected using our strategy exhibited strong MLC-2v expression and residual MLC-2a expression (Additional file 8: Figure S4a). This pattern was actually consistent with the MLC-2a expression during embryogenesis. Not like MLC-2v is restrictively expressed in the ventricular segment, MLC-2a is uniformly expressed throughout the whole heart tube at E8.0 in mice . With further maturation of the ventricles, MLC-2a expression is downregulated and disappears by E13.5 in ventricular chambers and is only expressed in the atria. Thus, further maturation of the selected MLC-2v-positive cardiomyocytes should better direct them into the ventricular lineage. We thus next sought to further induce maturation of the enriched MLC-2v-positive early ventricular cardiomyocytes . Culturing the MLC-2v-positive cardiomyocytes with the maturation medium greatly enhanced the organization of the myofilaments (Fig. 6a), the cell size (Fig. 6b), and the sarcomere length of these cells (Fig. 6c). The percentage of cells with multiple nuclei, an indicator of cardiomyocyte maturation, also greatly increased (Fig. 6d). Expression levels of functional and mature genes MYL2, MYL7, MYH6, MYH7, TNNT2, CX43, ACTN2, CACNA1C, MYOM1, and RYR2 were all up-regulated in the further matured MYL2-positive cardiomyocytes (Fig. 6e). The ratios of MYL2/MYL7 and MYH7/MYH6, which indicate maturation of heart tissues, were also significantly increased (Fig. 6e). Calcium transients of the maturation medium-cultured MLC-2v-positive cardiomyocytes were much larger than those of the nonmatured cells. The transient amplitude, maximum upstroke velocity, and maximum decay velocity were all significantly increased (Fig. 6f). All these results demonstrate further maturation of the selected MLC-2v-positive cardiomyocytes. For the scaffold of the engineered tissues, we used decellularized natural heart ECM [19, 23, 24] by perfusion of native rat cadaveric heart with detergents (Fig. 7a). Immunofluorescence staining was used to detect ECM compositions. Laminin, fibronectin, and collagen III, which are major proteins of the ECM, remained present within the decellularized heart matrices after removal of cells (Fig. 7b). Nonmyocytes such as fibroblasts are also another indispensable component for bioengineered heart tissues . In this study, we used mesenchymal cells derived from Warton's jelly of the human umbilical cord as the nonmyocyte component . To yield optimal structural and functional properties for EHTs , we used the combination of hPSC-derived 75% ventricular cardiomyocytes and 25% umbilical cord-derived nonmyocytes (Fig. 7c). The mixture of cells on pieces of decellularized native rat heart ECM formed a compact tissue-like structure after 2 weeks (Fig. 7d and Additional file 16: Figure S7). H&E and immunofluorescence staining indicated that the mixed cardiac cells attached and grew well on the native heart matrix (Fig. 7e, f). Immunofluorescence staining for the coexpression of cTnT and α-SMA or vWF indicated the newly formed tissues contained cardiomyocytes, smooth muscle cells, and endothelial cells, which are the primary cell types in human adult heart tissues (Fig. 7g). However, expression of CD31 was not detectable (data not shown), suggesting that mature vessels were not fully formed at this moment. Meanwhile, cardiac gap-junction protein connexin 43 (CX43) was present at numerous points of contact between adjacent cells, which promote cell–cell contact and rapid electrical transmission for the heart tissues (Fig. 7g). These engineered ventricular heart muscles exhibited spontaneous contractile and electrophysiological activities (Additional file 17: Video S6) and responded well to pharmaceutical reagents verapamil (Fig. 8a), nifedipine (Fig. 8b), E4031 (Fig. 8c), and epinepherine/metoprolol (Fig. 8d) in vitro. Obtaining a pure population of human ventricular cardiomyocytes would greatly strengthen human heart tissue engineering and regenerative therapy for ventricular damage. Using TALEN-mediated genomic engineering, we have successfully inserted the neomycin and EGFP selection markers directly after the ventricular-specific MYL2 gene within the genome of hPSCs. In this way, neomycin or EGFP was coexpressed with MLC-2v in a separate form when hPSCs were differentiated into cardiomyocytes. Based on these markers, we were able to enrich highly pure human early ventricular cardiomyocytes from hPSC cardiac differentiation and use them for construction of engineered human ventricular heart muscles. Previous studies used a different strategy than ours to select hiPSC-derived early ventricular myocytes. They produced either lentiviruses or adenoviruses carrying MYL2 promoter-driving fluorescent proteins, generated stable infected hPSC lines or infected hiPSC-derived cardiomyocytes, and then collected the MLC-2v-positive cardiomyocytes by FACS [17, 18, 28]. However, there are certain limitations of virus-based techniques: the virus infection rate is usually low in hiPSC-derived human cardiomyocytes and this will lead to a waste of many noninfected cardiomyocytes ; and using viruses raises safety issues and causes the problem of ectopic genomic insertion and leak expression, which further compromises the purity of selected ventricular cells and their future clinical use. Our method avoided the disadvantages of virus-based strategies and will be more suitable for future clinical applications. In terms of selection efficiency, our neomycin-based drug selection strategy yielded a very high efficiency and purity (~99%) of MLC-2v-positive hPSC-derived cardiomyocytes. The EGFP-based selection strategy yielded a ~ 10.4% efficiency in sorting pure MLC-2v-positive cardiomyocytes from cardiac differentiation of hPSCs by FACS. This could be due to the relative weak EGFP expressions because of only one allele insertion of the EGFP cassette after the MYL2 locus. Homozygous insertion of the EGFP cassette may further increase the EGFP expression level as well as the resulting selection efficiency and should be examined in the future. Of note, a recent pioneer study developed strategies for selection of mouse ESC-derived ventricular-like cardiomyocytes based on molecular beacons (MBs) targeting the ventricular specific gene IRX4 . However, the transfection efficiency of the MBs targeting IRX4 in human PSC-derived cardiomyocytes was not reported and remains to be investigated. Our neomycin-based selection strategy exhibited ~ 99% efficiency in enrichment of human MLC-2v-positive ventricular cardiomyocytes and avoided steps of FACS in the MB method, which further reduced the chance of contamination by flow cytometry. By combining decellularized native heart matrix as the scaffold, the selected pure hPSC-derived early ventricular cardiomyocytes, and mesenchymal cells derived from Warton's jelly of human umbilical cord as the nonmyocyte component, we further constructed pieces of engineered human ventricular heart muscles with different sizes and shapes. These engineered human ventricular heart muscle constructs responded well to pharmaceutical agents specific to heart physiologies including epinephrine, nifedipine, E4031, and verapamil. Of note, although we used 75% ventricular myocytes and 25% nonmyocytes  to make these constructs, the optimal percentage of myocytes and nonmyocytes should be determined in the future. The treatment effect of these human ventricular heart muscles for ventricular myocardial damages should be further tested. In the future, it is feasible to use our method to construct functional individual-specific ventricular cardiac patches based on hPSCs for ventricular disease modeling, drug screening, as well as personalized regenerative therapy for ventricular damage. This study provides a novel and effective system for isolating hPSC-derived ventricular cardiomyocytes by introducing genetic constructs into hPSCs using TALEN-mediated genomic editing. Clinical-scale homogeneous human ventricular-specific cardiomyocytes could be isolated based on G418 selection or flow cytometry. When combined with promoting maturation and using decellularized natural heart ECM as the scaffold, our study for the first time constructed functional engineered human ventricular muscles of desired shape and size in a dish. Overall we believe these engineered human ventricular heart muscles should have great potential in cardiac transplantation studies and cardiovascular research. The authors thank Jianwei Liu for his expert technical assistance. This work was supported by the National Natural Science Foundation of China (NSFC No. 31571527, No. 81322003) (to NS); the Science and Technology Commission of Shanghai Municipality (No. 17XD1400300) (to NS); Shanghai Key Laboratory of Birth Defect 13DZ2260600; the National Key R&D Program of China 2016YFC1000500 and 2016YFC1305100; the National Key Scientific Research Projects 2014CBA02003; the National Natural Science Foundation of China (No. 31571528) (to PL); and the Natural Science Foundation of Zhejiang Province (No. LR15H020001) (to PL). BL and HY performed experimentation, acquisition and analysis of data, assembly of data, and manuscript writing. XW and YZ performed patch clamp and helped in the analysis. WS, HC, and HX performed collection and/or assembly of data of EGFP system. QL, PZ, and CL participated in the design of the study and helped to draft the manuscript. RQ and SC performed conception and design. PY, JZ, and WS helped in tissue engineering and manuscript writing. GH provided financial support and manuscript writing. PL performed patch clamp and helped in the analysis. NS performed conception and design, administrative and financial support, manuscript writing, and final approval of the manuscript. All authors read and approved the final manuscript. All animal experiments in this study were approved by the Institutional Animal Care and Use Committee of the Fudan University (Committee approval number: 20140423) and were performed in accordance with the Guide for the Care and Use of Laboratory Animals (National Institutes of Health). All human stem cells research followed the ISSCR Guidelines for the Conduct of Human Embryonic Stem Cell Research. The human ESC line H7 used in this study was obtained from WiCell Research Institute under specific Material Transfer Agreement. The human iPSC line was derived from human skin fibroblasts with informed consent approved previously by the Bioethics Committee of Zhongshan Hospital affiliated to Fudan University. All authors have contributed to, read, and approved the final manuscript for submission.